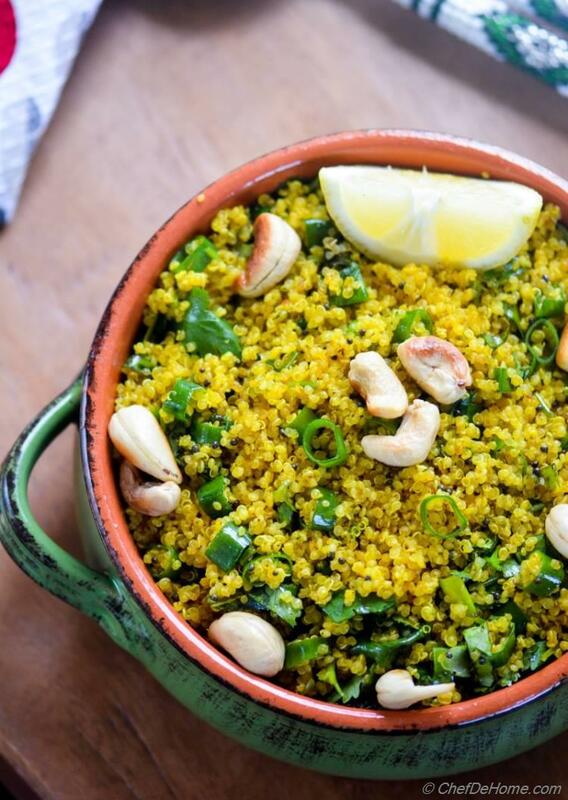 I have to admit: whenever....., I mean, WHENEVER I make this bowl of Lemon Curry Quinoa, I end up eating half of it for tasting! Every spoonful of this lite, curry (turmeric) fried lemony quinoa just makes me crave for the next spoonful.... it is that much delicious! So, considering my over-addicted love for quinoa, specially this one, needless to say that every time I thought to click few pictures and share with you... I never had enough left! No kidding! seriously! This time, I boiled double batch of quinoa and left half of it in refrigerator to make Curry Lemon Quinoa and share with you (finally). The best part of this delicious side is, even Vishal loves it! What else will I ask for?! 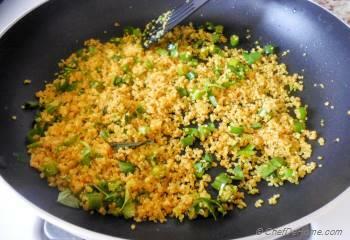 In-fact, if I don't make it for few weeks, he will ask, how about some lemon quinoa for lunch? And I'm like: Sure! Why not?? ;) hahaha! 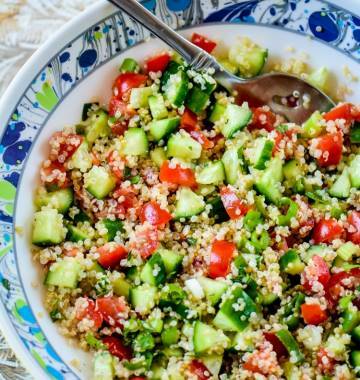 You know, it takes only 20 minutes to pack this for lunch and it quinoa is healthy too! Vishal and I, both don't mind eating side dishes for lunch once-in-a-while... specially when we are out of salad ingredients or not in mood to eat salads. 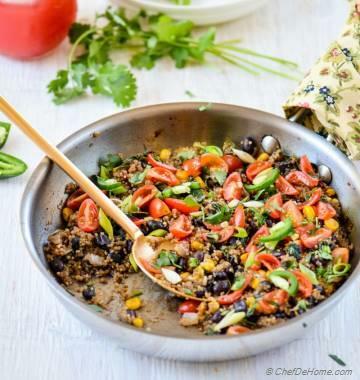 :) Often, I also add some veggies in this quinoa to make lemon quinoa veggies fried rice kind-a lunch bowl for both of us! 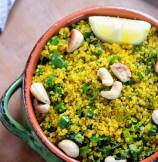 Inspiration for this lemon quinoa comes from, one of my favorite, lemon rice. Lemon Rice is a South Indian Rice recipe which is favorite among my family, friends, and even office colleagues. One of our common friend from office specially demands for Lemon Rice whenever she visits us or if we are meeting for a potluck. She will say, Savita, just bring your Lemon Rice! Why on earth does not every one adds lemon and curry in rice!! lol! Oh yeah! This is vegan too! Also, very less per-serving of fat. Other than being gluten free and vegan, you can also make quinoa nut-free if you skip cashews. 2. One of the quickest side ever. 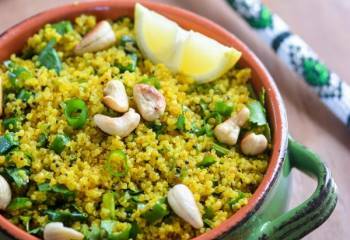 If serving for dinner, curry lemon quinoa will be ready in just 20 minutes. 3. This is sure kids-friendly. Also, perfect way to sneak-in some veggies kid's meal. 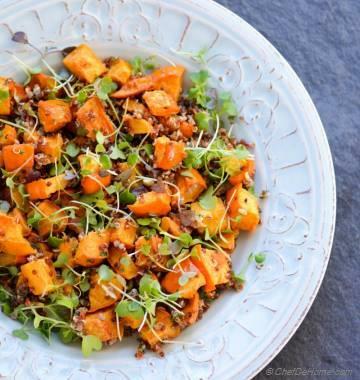 Add some chopped carrots and sweet peas to make veggie fried quinoa. Since I have used turmeric and paprika only, curry taste is not overpowering at all. Plus lemon juice adjusts spice level very well. You can also add some raisins for sweetness. 4. One cup cooked quinoa is about 10 grams low in carbs than equal amount cooked white rice. Also, quinoa has 8 times more potassium than white rice. So, with portion control, quinoa is great way to eat filling yet healthy and fulfill daily supply of potassium. 5. It will stay good in refrigerator for up-to 1-3 days! So, go ahead, make ahead and enjoy for dinner any day up-to 3 days! 6. Plus it tastes great. Lemony, lite, and delicious! I hope you enjoy my delicious take on Fried Quinoa (Rice). Smart Swap Use mild curry powder instead of turmeric and paprika, then adjust paprika per taste later. 1. 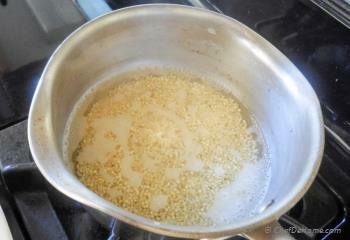 Cook Quinoa - In a deep pan, bring 2 cup water to rolling boil. Add 1/2 tsp salt and quinoa. Bring to boil, then simmer for 7-8 minutes or until qunioa sprouts strings are visible. Cover and remove from heat. Set aside. 2. 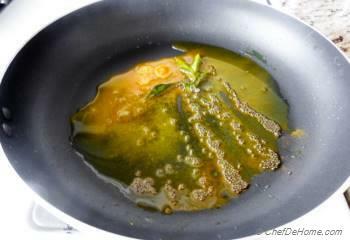 Heat oil in a Wok or Kadai. Add cashews and fry for 30 seconds or until cashew are slight brown at edges. Remove and drain on paper towel to absorb extra oil. You can also use pre-roasted cashews instead of frying raw and skip this step. 3. In same heating oil, add mustard seeds, allow to sputter and then add curry leaves (if using or bay leaf) and fry for another 30 seconds. Add turmeric powder and fry for 10 seconds. 4. Now, add red pepper powder (or paprika) followed by cooked and quinoa (quinoa will be dry by now, all water absorbed, if not drain excess water). 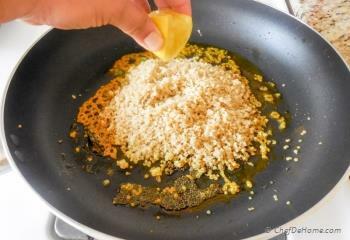 Fry quinoa for 1 minute on high heat, then add lemon juice. 5. Mix in chopped cilantro and scallions. Remove from heat. Taste and adjust salt and lemon juice. 6. Mix in cashews and transfer to a serving bowl. Serve and enjoy! Leftover cooked quinoa also works perfect for Curry Lemon Quinoa. Wow! This looks gorgeously appetizing Savita! I am drooling over these vibrant and inviting pictures. And I am so in LOVE with that alluring green pot. They say it right, food served in green makes us hungry. 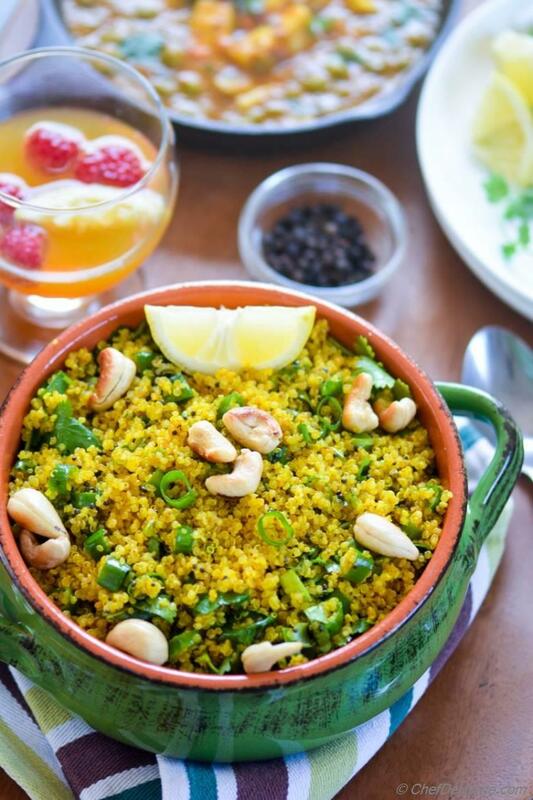 A big yes to this YUMMY bowl of quinoa and lemon goodness. Anu, thanks! I love your encouraging words! And YES, me too in LOVE with this green pot these days! Since I bought it, I was eagerly waiting to cook and share something in it. :) thanks for stopping by my friend! I appreciate it. 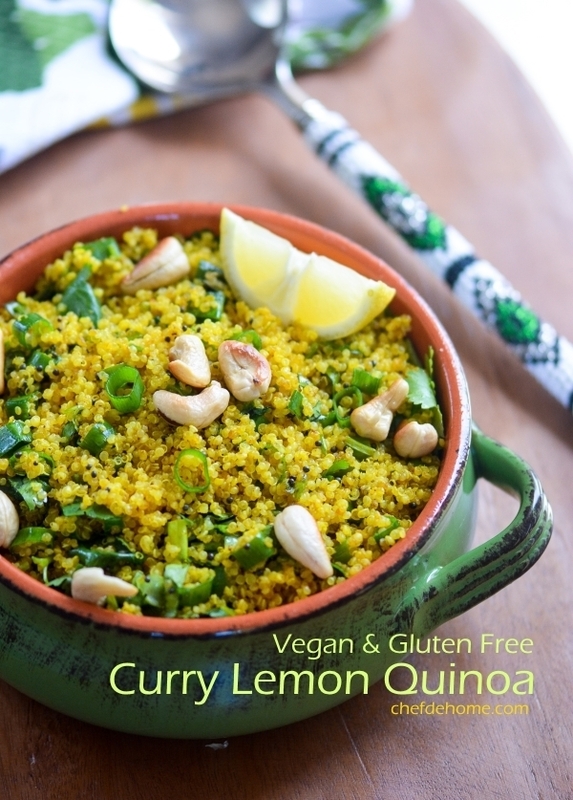 I need to try this, maybe hubby will start eating quinoa this way ;) Love it Savita, I love lemon in everything! Yum! Manali, thanks! I'm sure your hubby will love it! When Vishal started liking quinoa, it was an achievement for me ;) this one is his favorite!